Earlier this spring, I had the bright idea to grow a garden in cattle tubs. I call it my CTC (Cattle Tub Container) garden. If you are unfamiliar with these, they are large, extremely durable plastic tubs that contain supplement feed for cattle, like vitamins for cows. We have a couple of friends who raise cattle and were able to get a few of these tubs from them. I wanted to set them up in the back yard, near the house where they would be easy to water. We had the perfect place in a corner by the peacock shed. I had Tom set them up in that corner after we had covered the area with weed barrier. First he drilled some holes in the bottom of each tub for drainage and put some sticks in the bottom to keep the soil from packing down too tightly and clogging the drainage holes. We bought potting soil that was 45% bark to allow for good drainage and I mixed it with compost to provide plenty of nutrients. I didn't have enough to fill all the tubs, but if I have good success growing in the tubs, then I will fill the rest of them next spring. After the tubs were filled, I planted sweet potatoes in some of them. We have difficulty growing sweet potatoes in the field because the deer love them. It will be a very brave deer that jumps inside the fence and braves our very vicious Sally dog to get at them here! Actually, Sally was a stray that we adopted and was crippled by a bullet in her shoulder. So, she's not much of a danger to the local deer population. And, I planted strawberries in some of them. And, rhubarb in a couple of them. 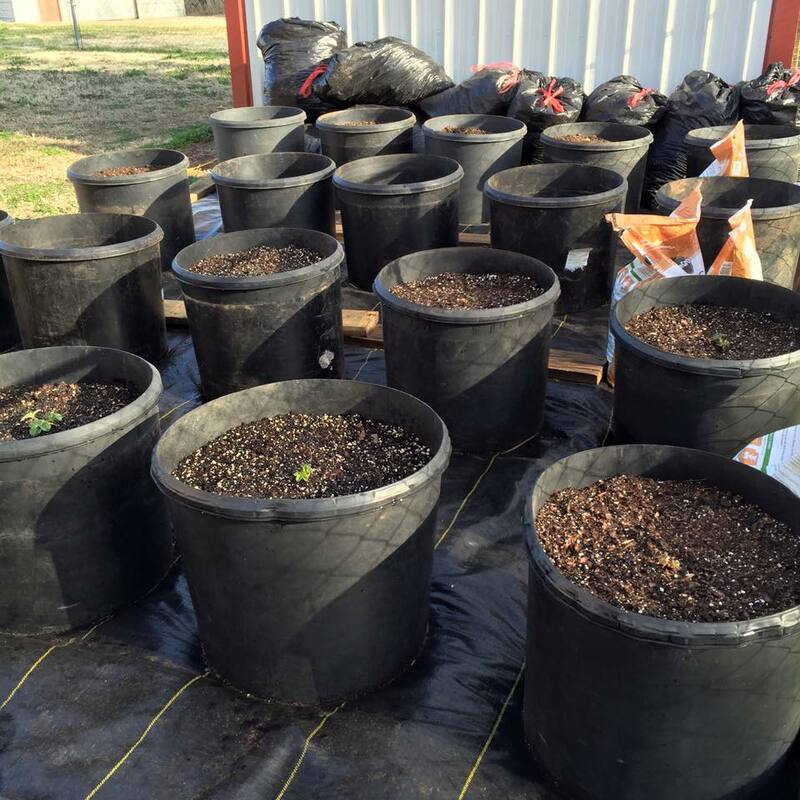 The county extension agent told me rhubarb is difficult to grow in this part of Oklahoma, so I'm hoping by planting it in these tubs, I will be able to manipulate the growth conditions to give it a better chance of survival. Something has eaten holes in the rhubarb leaves and many of the sweet potato leaves. I'm not sure what it is. But, the plants do not seem to be suffering too much as a result, so I'm not too worried about it. I added a layer of leaves to the top of the soil to keep the tubs from drying out so quickly. Even then, I've had to water them every 2 to 3 days during the hottest weather. So, I plan to add a drip watering system to keep them watered next year. The best thing about this project is that it has basically eliminated any weed problems. So, I am optimistic! If all goes well, this may be the way I garden from now on. Occasionally, there is a bit of drama in the chicken coop. A while back I was in there to check on their food and water when I noticed all the nests were occupied. The nest on the left is occupied by Gertrude. She is at the top of the pecking order and is one of the first batch of chicks we got back in 2012 when we became first-time chicken owners. On the middle nest is Goldie. We got her, along with 3 other chicks, last year. One of the Rhode Island Red hens which we got from a friend in 2014 is on the last nest. I honestly cannot tell the RIRs apart, except for one who has a different kind of comb. This is not her. So, I'm not sure which one this is. So, now for the drama. Gertrude apparently was not satisfied with her nest and decided to check out the other nests to see if she could find one better to her liking. Notice that there is already an egg in Goldie's nest. Now, just because the egg is there does not mean she laid it. It could very well have been laid by someone else earlier in the day. Perhaps it was the egg that made the middle nest look more attractive to Gertrude, but for whatever reason, she decided this was the nest she wanted to use. She sat on the edge of the nest for a little while, perhaps to give Goldie a chance to leave peacefully. However, when Goldie showed no sign of vacating, Gertrude began to edge her way in anyway. Being the top chicken, Gertrude gets her way and Goldie eventually gave in and let her have the nest. Gertrude carefully lowered herself on the egg and settled down. Whether or not she laid an egg of her own, I have no idea. Hens will sometimes sit for long periods of time on a nest and never lay an egg. It is like the nest is their place to go meditate. If they lay an egg while meditating, then all the better. I didn't have time to stick around to see what Goldie decided to do. She may have given up for the day or have come back later and tried again. At any rate, I found this bit of drama to be quite entertaining. Chicken interaction can be quite interesting!